Revenge of the Nerds.Interscope Communications 1984. I guess one can look at this movie as the beginning of geek acceptance. It looks like it’s going to be a rehash of all the old awful stereotypes of what geeks are, but they’re the heroes, so it’s already a minor improvement. Some names in the cast that I recognize: John Goodman and James Cromwell. I don’t expect important roles though. They strike me as mentions because they got famous. Gilbert and Lewis are a pair of nerds arriving at college for the first time. This college is home to the Alpha Beta fraternity of athletes, who institutionally persecute nerds as a matter of course, and when the AB house burns down on the first night of school due to playing with alcohol fireballs carelessly, the football coach decides that his boys will be housed in the Freshman dorm until their place is rebuilt, forcing the freshmen to find other housing. While most are able to find fraternities to take them in, Gilbert and Lewis are part of a bunch of misfits nobody accepts, who all get a house together. The Alpha Betas haze the nerd house, and unfortunately they live in a Bizarro world where only the Greek Council, led by the Alpha Betas, can punish fraternities. 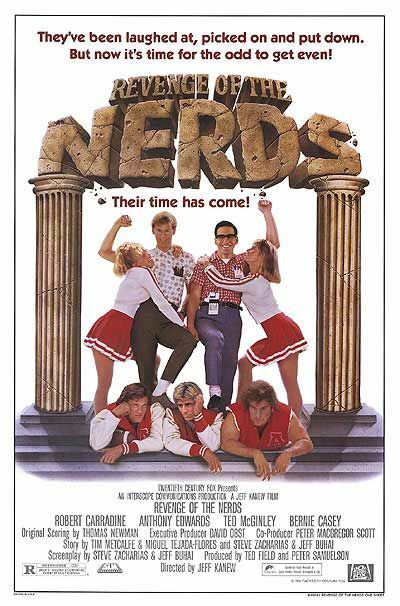 In order to get what they deserve, the nerds must form their own fraternity and win the Homecoming Decathlon so they can secure the leadership of the Council. Because obviously the group that can bicycle the furthest while drunk is most suited for leadership. During the first act, I was constantly cringing at the 40-something screenwriters’ perception of what college is: an exaggeration of high school minus authority plus beer. Yes, that’s what all college hijinks movies are like, but with the addition of the “just because” jock/nerd rivalry, I was gritting my teeth until the story got going. After the rivalry became personal and the insulting responsibility-free atmosphere faded into the background, I found the story fairly enjoyable, aside from the dumb logic that keeps the nerds underdogs until they prove themselves. As I expected, the stereotypes were also unfortunate. When I saw Gilbert looking relatively normal next to Lewis’s full-on dork look, I realized they couldn’t all be cookie cutter nerds, and decided Lewis must be the movie’s total stereotype nerd. That honor actually goes to Poindexter, who has thicker glasses, weirder hair, stuffier attire, and more social ineptitude. An honorary mention for Wormser, a ten year old kid so advanced he’s in college. You really know he’s smart because he wears a bow tie. I’m not sure how I feel about the non-nerd outcasts getting lumped into the “nerd” category. A gay black guy and a disgusting creep round out the gang, but seem like they’re getting the same treatment for more than just association. John Goodman had a bigger role than I expected, and I really enjoyed him as the coach. James Cromwell’s brief part as Lewis’s dorky father is entirely unlike what I’ve come to expect from him, and he even gets officially credited as “Jamie Cromwell”.